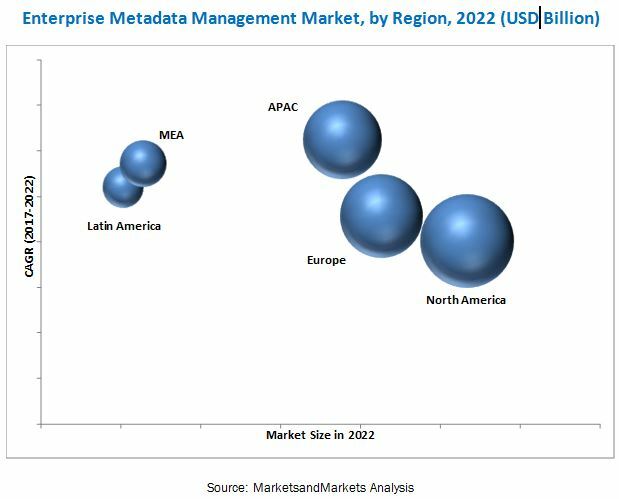 [149 Pages Report] The enterprise metadata management market size is expected to grow from USD 2.21 Billion in 2016 to USD 7.85 Billion by 2022, at a Compound Annual Growth Rate (CAGR) of 24.1%. The major growth drivers of the market include centralized data management, governance, risk and compliance management, increasing business data volume, and operational excellence and data quality management. The base year considered for this report is 2016 and the market forecast period is 2017–2022. The main objective of the report is to define, describe, and forecast the global enterprise metadata management market on the basis of components (tools and services), applications (governance and compliance management, risk management, product and process management, incident management, and others), metadata types (business metadata, technical metadata, and operational metadata), deployment models, industry verticals, and regions. The report provides detailed information regarding the major factors influencing the growth of the market (drivers, restraints, opportunities, and industry-specific challenges). The report aims to strategically analyze the micromarkets with respect to the individual growth trends, prospects, and contributions to the total market. The report attempts to forecast the market size with respect to 5 main regions, namely, North America, Europe, Asia Pacific (APAC), Middle East and Africa (MEA), and Latin America. The report strategically profiles key players and comprehensively analyzes their core competencies. It also tracks and analyzes competitive developments, such as partnerships, collaborations, and agreements; mergers and acquisitions; new product launches and new product developments; and R&D activities in the market. The EDM ecosystem comprises vendors, such as Adaptive (US), ASG Technologies (US), Cambridge Semantics (US), CentricMinds (VIC), Collibra (US), Data Advantage Group (US), IBM (US), Informatica (US), Oracle (US), SAP (Germany), Talend (US), TopQuadrant (North Carolina), Alation (US), AWS (US), Datum LLC (US), Infogix (US), Mulesoft (US), Global IDs (US), Smartlogic (US), Idera (US), erwin Inc. (US), Information Builders (US), Orchestra Networks (France), Trillium Software (US), and Varonics Systems (US). The other stakeholders of the EDM market include network and system integrators, EDM managed service providers, cloud providers, marketing analytics executives, third-party providers, and technology providers.These Enterprise Metadata Management Software Vendors are rated and listed by us on the basis of product quality, reliability, and their business strategy. Please visit 360Quadrants to see the vendor listing of Enterprise Metadata Management Software. The Enterprise Metadata Management market is expected to grow from USD 2.67 Billion in 2017 to USD 7.85 Billion by 2022, at a Compound Annual Growth Rate (CAGR) of 24.1% during the forecast period. Centralized data management, increasing business data volume, operational excellence and data quality management, governance, and risk and compliance management are expected to be the driving factors for the overall growth of the market. The Enterprise Metadata Management market report provides detailed insights into the global market, which is segmented on basis of components, applications, metadata type, deployment models, industry verticals, and regions. Each of these markets are further subsegmented and analyzed based on the current adoption trends and future market scenarios. In the component segment, the tools segment is estimated to hold the largest market share throughout the forecast period, as a variety of enterprise metadata management solutions serve a variety of purposes, such as resource discovery and stringent non-compliance penalties on the breach of any confidential data that might be internal or external to the company in the developed countries of North America and Europe. The cloud deployment model is expected to have a higher adoption rate than the on-premises deployment model and this trend is expected to continue throughout the forecast period. Cloud-based solutions are majorly deployed by large enterprises owing to various factors, including the reduced operational costs, simple deployments, and higher scalability. Cloud-based enterprise metadata management solutions are expected to grow at the highest CAGR during the forecast period. Among organization sizes, the increasing adoption can be observed among large enterprises, and the segment is expected to continue its dominating market position during the forecast period. The Small and Medium-sized Enterprises (SMEs) segment with the increasing focus on improving the customer experience is likely to have the highest growth rate during the forecast period. The Banking, Financial Services, and Insurance (BFSI) industry vertical is expected to have a dominant market share throughout the forecast period, owing to the increasing corporate data and customer critical information in this sector. In addition, the increasing customer transactions outside the branch through multiple channels, such as web, chat, mobile, and social media, are expected to lead to the higher adoption of enterprise metadata management solutions. The report provides in-depth analysis of different geographic regions and covers all the major aspects across North America, Europe, Asia Pacific (APAC), Middle East and Africa (MEA), and Latin America. Countries in North America, such as the US and Canada are the forerunners in the adoption of advanced security solutions. North America is the home to most vendors and organizations with a large operation base and customers. Having developed economies and being the early adopters of the technology, the region has witnessed a significant adoption of cloud-based security solutions, especially among the large enterprises. North America is expected to dominate the market throughout the forecast period in terms of revenue generation. However, APAC is projected to provide significant growth opportunities for the vendors and expected to grow at the highest CAGR during the forecast period. Uncertainty regarding the Return on Investment (RoI) is believed to be restraining the growth of the enterprise metadata management market. Inconsistent business semantics and data integration affecting data insights’ timeliness are said to be the major challenges affecting the growth of global market, especially in the developing regions. The enterprise metadata management market ecosystem comprises vendors, such as Adaptive (US), ASG Technologies (US), Cambridge Semantics (US), CentricMinds (VIC), Collibra (US), Data Advantage Group (US), IBM (US), Informatica (US), Oracle (US), and SAP (Germany). 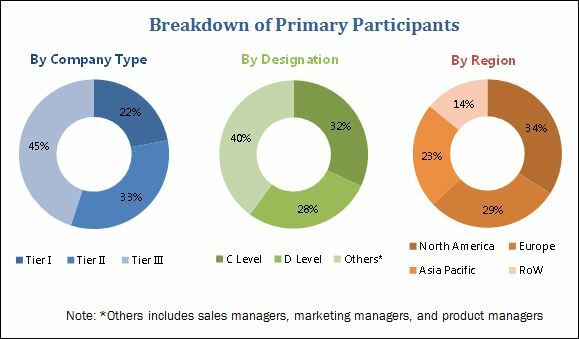 Vendors operating in the global market have adopted several organic and inorganic strategies, such as acquisitions, collaborations and partnerships, new product launches, and product developments to enhance their client base and customer experience. The partnership strategy has also been adopted widely by the topnotch players to enhance their market reach and provide innovative security solutions. For example, in July 2016, Oracle and Fujitsu partnered to deliver enterprise-grade, world-class cloud services to global customers, especially in Japan.